This mod is obsolete and will no longer be updated, check out "AutoPlant"
Auto Sapling was a quick little mod I made in about 30 minutes, but is actually very useful. When a sapling item would normally despawn, it replants itself on the ground! It's useful for two reasons: when you chop a tree down, you often leave before all the saplings have dropped, this mod plants those saplings, growing the forests over time and it makes automation of trees much easier! Does it work with mod saplings? Yes! Well, it should for most saplings (if they inherit the base sapling class). If you find a mod it won't work for, let me know and Ill see if I can fix it! That's stupid why would I want that? I have no clue, don't download it. MY GAME CRASHED FIX PLEASE! Show me the crash log or I can't help you. Go ahead and include this if you wish. Works like a charm. A little bit too good in fact. It'd be nice if there's a config option for chance ratio of saplings actually getting planted. I'd put it to 10% myself for the laziness of the player (and to prevent an unpassable forest from forming). Would such a thing be an option in the future? Does this now support dark oak? Because it always just plants the saplings where they land and dark oak will only grow if there are 4 saplings arranged in a square. The chances of 4 saplings winding up in a square arrangement are slim to none, so the thought is that if 4 dark oak sapling items are clumped together then when 1 plants itself the other 3 would plant with it forming a square. It's rare enough to have 4 dark oak sapling items close enough to clump. Another thought is to make a 1 sapling tree that can grow from dark oak saplings. I came up with a good shape if you want to see it. It's small like an oak and looks like a little dark oak with a 5x5 spread and a short, 3 block deep canopy. So, I had to have this installed on both Client and Server for my Client to be able to connect. 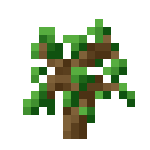 It does not appear to work on Saplings from the Biomes O'Plenty mod, atleast specifically the Magic Tree Sapling. Didn't test with other Mod Tree saplings yet.. Sadly with BoP that's an awful lot of saplings that wouldn't work, as BoP is a world generation system and has a LOT of different sapling types. Does this run serverside only? It's universal, I install in both my server packs and my client packs. ... However, I just did some ssp testing and it doesn't auto plant anything there, so the answer to your question, is it only works on the server side. Would be cool if Lemon fixed it so that it did work on single player. can you add an instant plant option to the config, off by default, in which case when on, when you chop a tree saplings won't even wait for the despawn timer! Just plant immediately if possible. Would be very useful on a skyblock world. Can you tell me what percentage chance saplings have of being planted? Is it 100%? I'm assuming extrabiomesxl does not use the base sapling class and I'd like to configure that mod with the same chance of saplings being replanted. Thank you. Hi, been using this great little mod for a while now. Noticed a possible issue with 1.3.1-MC19 with forge-1.9-12.16.0.1846 while clearing a marsh to build a witch farm I see saplings trying to plant themselves then popping back up in the water but not despawning, these could build up through time if not collected and possibly cause lag. Awesome! I much like it! Is it compatible with TreeCapitor? This is such a great idea and mod. Thanks for the work.